It's been a very long time since I bought methi greens. 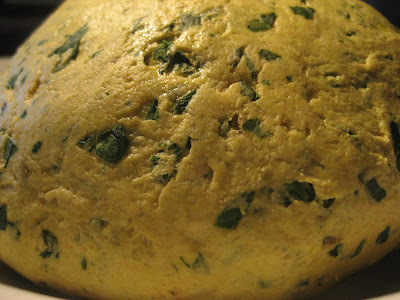 We used to have methi every single week when we had Gujarati nanny at our home. She would either make methi-potato baaji or methi thepla. After she left , I would have hardly made couple of times in 2 years. Somehow I was never inclined to buy that. Something struk my mind this time to not ignore the lovely greens and I got a bunch. Make equal sized balls out of the dough. Roll each ball into a nice circle with a rolling pin. If the dough is sticky, dust it with little flour and roll. Heat the pan and fry the parathas one at a time. Flip the paratha to the other side after 30 seconds. Once you flip it, smear a tsp of oil on the top and let it cook for one more min. 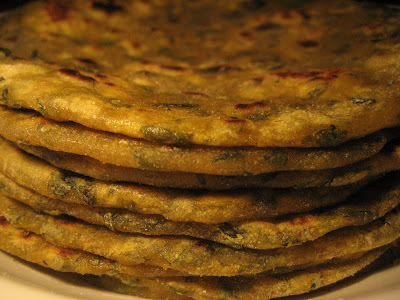 Take the paratha out of the pan once you see golden brown spots started appearing on the surface. Serve hot with plain yogurt and pickle. 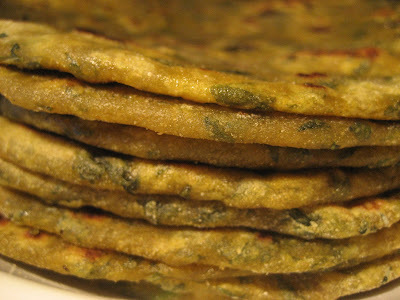 hey love methi parathas,nice recipe.Would love to c u on my blog. Glad that you liked the paratha recipe. Thanks for visting my blog. I will definitely visit yours.